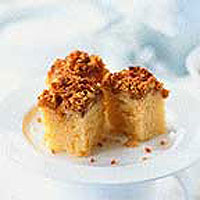 In America, a coffee cake is not a cake flavoured with coffee, as you might imagine, but any cake that might be eaten for breakfast or lunch with a cup of coffee. This one is made with soured cream and bananas, and has a hazelnut topping. You can store it in an airtight container for 1-2 days. Preheat the oven to 180°C, gas mark 4. Grease a 25cm square cake tin and line with baking parchment. To make the topping, place the flour in a large bowl with the hazelnuts, sugar and salt. Pour over the melted butter, then mix with a round-bladed knife until it resembles rough crumbs. Chill until needed. To make the cake, place all the ingredients in a large bowl and beat together until the mixture is smooth and thoroughly combined. Spoon into the tin and smooth with the back of a spoon. Peel and slice the bananas, then toss with lemon juice in a bowl. Scatter the bananas evenly over the surface of the cake mixture, then sprinkle over the hazelnut topping. Bake for 45-50 minutes, until a skewer inserted into the centre comes out clean. Cool for 10 minutes in the tin, then lift out. Serve warm or cold.